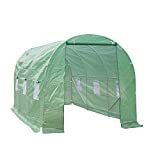 4.1 What is a Polytunnel Greenhouse? After a thorough examination of several of poly-tunnel greenhouses on the market today, we have found that the OGrow 2 Door Polyethylene Greenhouse is the best polytunnel available. It has two color options, a heavy-duty reinforced mesh, 8 ventilation window spots, and a solid six-month warranty on the frame. All this at a great price point! For more information on the OGrow Polytunnel, see our Product Reviews section below. Our runner-up choice is the Strong Camel Polytunnel Greenhouse. This option is a bit smaller than the OGrow, and only has one door and six window vents, but it is well made and is offered at a great price. For more information on the Strong Camel, see our Product Reviews section below. Our budget pick is the Outsunny Polytunnel Garden Greenhouse. It is slightly larger in size than the Strong Camel and hits a similar price point. Like the Strong Camel, the Outsunny has one zippered door and six windows, which provide pretty good ventilation through the tunnel. For a full review of the Outsunny, see our Product Reviews below. In this section, we’ll look at what the Polytunnel is, and why buyers might want one. We’ll also consider maintenance and general use. What is a Polytunnel Greenhouse? A poly-tunnel is, in effect, a structure for growing plants undercover. These semi-permanent structures are pretty similar to a traditional greenhouse but are more adaptable. A poly-tunnel is not the square frame of a traditional greenhouse, it is a rounded long shape. Plus, they are usually bigger. Poly-tunnels are pretty similar to tents, soft-top gazebos, and pop-up gazebos, as all have the same basic metal frame with a cover. Greenhouse tunnels come in varying sizes, from a large walk-in with an area for pottering around, to a framed covering at floor level, protecting plants in rows. While most look the same: a curved tunnel, they do vary in quality. If you have electrical hook up, then you can even install heaters and coolers. Poly-tunnels are ideal for indoor growing as they maintain the heat, and help to keep out the frost. These features mean that growers can harvest crops, all year round, including out of season plants at any time. For growing fruit trees in cold climates, these are a must! The plastic cover holds in the humidity well, all helping you to achieve healthy crop management. To allow plenty of light on crops that need it, many of the durable polyethylene (PE) covers are semi-transparent, though they range from completely translucent to varying shades of green. The darker the green, the less the light can penetrate, which is ideal for plants that require less light. See our guide to polytunnels vs. greenhouses for more information. Unlike most traditional glass or polycarbonate greenhouses, a polytunnel can be built on natural ground. This provides a significant advantage to a polytunnel: you can grow plants in the ground while still covering them for eat and humidity. The ability to grow plants on the ground, combined with the ability to move your polytunnel when needed, make these units great tools for serious gardeners. The larger sized poly-tunnels typically come with two doors at the ends and roll up plastic shutters on the windows. Once rolled up, the openings become a breathable net-mesh that allows ventilation to circulate. The netting also stops bugs from getting through. For thorough ventilation, it is also better to have the door(s) rolled up too. These usually do not come with net-mesh covers, so be aware that pests can still enter your growing area. When you have the doorway open, to protect against pests you can buy bug netting to cover your plants. Alternatively, you can buy a fiberglass mesh and make your own barrier for the doorways. The frame is usually steel that is coated with a light thermoplastic nontoxic powder. This means the metal is more resistant to damage, such as chipping or corrosion. The frame is usually held together by various clips or Velcro tags. For extra security against the elements, guy ropes and stakes are provided in much the same principle as staking out a tent. It is essential to stake the cover firmly to the ground to keep it secure and to avoid breakage and damage to your greenhouse and plants! Perhaps the most important aspect of a polytunnel is its ability to withstand the elements. Come sun, wind, rain, or snow, you want a grow house made of reliable materials that won’t collapse, blow away, or fail in the middle of rough weather. Most complaints users have regarding polytunnel greenhouses are based around such weaknesses as stakes that are not big enough, and tight-fitting covers that leak at the seams. When you assemble your poly-tunnel, whichever model you decide to go for, proper staking out is an all-important factor in whether or not it will blow down, come those first winds. Poly-tunnels provide great protection for indoor crops, but it is recommended that you stake it down well so that air cannot enter through the sides. This sort of air flow could result in your plastic cover blowing away. Customers who have taken extra care tend to be more than happy with their lightweight poly-tunnels. In the winter, if you wish to continue growing you can do so. Poly-tunnels hold their humidity well if you have indoor greenhouse heaters. Plus, it might be a good idea to invest in an extra-large tarp to throw over the top and pin down so it is secure. As with any greenhouse, poly-tunnels need to be assembled. Experienced users can most likely construct it from scratch, with two people in an hour or so. Once constructed, the structure can still be moved, as it is lightweight. Depending on the design and circumstances, you may need to partially dismantle the tunnel in order to move to a new spot. Another advantage of the poly-tunnel, compared to a traditional greenhouse, is that they do not need to be built on level ground. They could be situated on a slope, providing they are well staked down. Because of the nature of the materials, they are better placed away from windy areas if possible. For those less experienced in assembling a poly-tunnel, there are many instructional videos on the internet. For the tunnels we review today, we will link to assembly videos where possible. Poly-tunnels do tend to need a clean in the spring, as a damp winter can cause algae growth. Use a plant and food safe detergent, such as Krud Cutter or Algon, a safe organic cleaner. The most fragile portion of the polytunnel is the cover, as the frame is generally pretty sturdy. If the cover gets damaged, there are repair kits available that may be able to seal rips in the seams. And if the damage is too great, very often it is pretty easy to purchase a replacement cover that is designed to fit over your existing metal frame. It’s a lot cheaper to replace the polyethylene cover than it is to replace a few panels of polycarbonate sheeting, or glass! There are many models of poly-tunnels available on the market. To help you make the decision in what works best for your own situation, have a look at our winners and losers, and a few more besides. By understanding the basic nature of how a poly-tunnel works, you will be better armed to decide on the right model for your own indoor growing. In this section, we’ll look at five of our favorite polytunnel greenhouses. We’ll consider the positives and negatives of each, and highlight differences between them. To conclude, we’ll reiterate our favorites. We’ll start with a comparison table to get the lay of the land, and then move into the individual product reviews. Manufactured for OGrow, specialist wholesalers in greenhouses. Cover supplies UV protection and extra length at sides to ensure no drafts can get enter. Two extra wide doorways that can roll up (one at either end). Eight roll-up windows, four per side, covered with mesh netting for cross ventilation. Heavy-duty powder-coated steel frame, with double rails in the middle. Includes guy ropes and lots of deep rooting stakes. OGrow offers a 6-month warranty on the frame and a 90-days on all accessories. Dimensions: 15′ L x 6′ W x 6′ H feet. Eight windows, with four on each side, all with roll-up shutters. Size: H21 x W29 inches. The materials include black steel tube frames, PE plastic green or white cover with net windows and roll-up blinds. Four guy ropes with 4 plastic and 16 metal ground stakes. 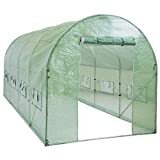 The OGrow walk-in tunnel greenhouse really is an excellent choice for many budding gardeners, as it has a large size, comfortable width, and a great deal of ventilation. The two-door feature is a significant one, and is one of the primary reasons the OGrow got our top pick as the best Polytunnel Greenhouse. OGrow stress the importance of their waterproof and UV resistance covers. The fact that their covers are made of a 6mm double-ply reinforced mesh is a significant plus. If there is a spot for failure on these polytunnels, it is the zipper mechanisms. There are complaints of cheap zippers on doors and windows, breaking all the time. Be gentle with the zippers when using them. While it stands well in the wind and rain, it does not offer any insulation from the frost, so you will need to add an extra cover in the cold months. It holds heat well if you run a greenhouse heater inside. The instruction to put this grow house up are easy to follow and all the poles are numbered. Should you have any difficulty with assembly of this model, then you can find their assembly manual here [OGrow]. Check your package when this poly-tunnel arrives in the post, customers have reported missing and damaged parts, though all are replaceable with the warranty. There is good warranty on all the parts of this poly-tunnel, which can give peace of mind. What really stands out on this model is a door at either end. Not only can this allow a through draft, but you could also stand one poly-tunnel next to the other for an extended grow house. The Winner of our Best Product Review is the OGrow 2-door Walk-in Poly-tunnel. With two doors with extra width and eight optional vent windows, your indoor crops can have plenty of air flow. It also allows for an extended tunnel if extra space is needed. Assembly instructions appear easy to follow and they also provide those all-important deep-rooted stakes. The fact that the OGrow offer good warranty on all parts makes the extra cost worthwhile, for peace of mind. We just wish they supplied better zippers. Smaller poly-tunnel, but still a good size. 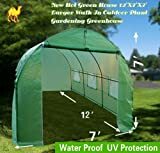 Waterproof and UV protected green cover. Six mosquito windows with Velcro fasteners to baton down. Powder-coated 6mm steel tube frame. Includes guy ropes and stakes. Size: L12 x W7 x H7 feet. Three windows at either side, each with roll-up shutters. The materials include steel tube frames, green PE cover with six roll-up windows. Guy ropes and ground stakes and any other accessories needed. The Strong Camel hot house polytunnel is a well-built garden building, but it is the smallest poly-tunnel to be reviewed in this article. The build-out is decent, however, the lack of a second zippered door is a noticeable omission. Regardless, it’s still a solid choice for its price range, and it is our runner-up choice among polytunnels. Most customers have found that the Strong Camel holds up well in winds, but still needs bigger stakes than the ones provided. When winter comes, it might be better to put a second extra-large tarp over the roof for added protection. And obviously, if you’re in an area with large amounts of heavy, wet snow, this tunnel will probably bow if not constantly cleaned of snow. The wind vents are well made, and the velcro is a nice touch (avoiding the issues the OGrow runs into with zippers). However, the velcro windows create their own issue, as the seal is not as strong as a zipper would be. Consequently, cold air tends to get into this greenhouse more easily than other greenhouses. The zipper on door is not too strong, but this seems to be a general complaint for many of these plastic tunnels. A few customers are not happy with the quality of the cover, which is not replaceable, stating that the frame outlives the cover. Hopefully, Strong Camel will start to sell replacement covers on their own. All parts are labeled, making it easy to assemble. To view the instructions, click here. The Strong Camel Poly-tunnel might be smaller, but it is also purchased at a good economical cost. It has only a single doorway at one end, but does boast six mosquito netted vent windows. There is plenty of customer feedback for this product, indicating it is a popular buy. While not every customer is happy, and many having the same general complaints about poly-tunnels in general, this model seems to hold up well to scrutiny. Many have found that it does well in winds and rain, but any significant snow is too much for it. The frame appears to outlive the none replaceable cover, which is a shame, but it does prove that the frame is strong. It also comes in at the lightest model, making assembly easy for one person. STEEL TUBE SIZE: 19/19/16mm x 0.6mm with green powder coating. The Outsunny is manufactured for Aosom Direct, a leading outdoor equipment provider. Large sized walk-in portable poly-tunnel. Six windows, 3 at either side. One zippered doorway that rolls up. Four guy-ropes and ground stakes, though reports have indicated that the ones provided are too small. All the necessary tools come with the kit. Aosum Direct, offer a 30 day returns policy on all their products, but this may be dependent on who you buy your poly-tunnel from. Large length of 15 x 7 x 7 feet. Other measurements include a single door at L6.2 x W3.6 feet. Each of the 6 windows are 1.3 feet in length and width. The materials of this model includes: steel tube frames, clips, PE plastic deep green cover with net windows, 4 guy ropes, 4 ground stakes. Weighs in at 36.5 lbs. The Outsunny Tunnel greenhouse is a nice choice for many, with one zippered doorway, and six windows allowing reasonable amounts of ventilation through the polytunnel. These qualities, plus a large size and low price, made this tunnel our budget choice. The shape of this grow house is the typical curved tunnel design. The green of the cover helps it to blend into the greenery of a garden. The fact that this tunnel only has one door, may not always be adequate to provide a through breeze for good ventilation. There are six mesh windows, but if you have tables inside, these could become obstructed. The cover is an ample size for pinning to the ground and eliminating any gaps, though you would need extra stakes to do so. There have been reports of customers using larger pegs than provided, to help give additional strength to the polytunnel, and to help it withstand the elements. The steel frame is powder-coated for rust-resistance. The instructions for erecting this grow house are not too clear, unfortunately. There are only so many pieces to put together, but Outsunny needs to work on their assembly instructions. For such a low cost, this is quite a large grow house. The Outsunny has a good returns policy, which is helpful with outdoor products. Again, this is a light model of only 36.5lbs, making it manageable for assembly. The extra-large cover allows for further anchorage, always encouraging for overcoming the elements. Manufactured for Best Choice Products, an affiliation of Sears, a leading retailer. At 15 feet long, this poly-tunnel is quite large. The clear green threaded PE cover is classed as heavy duty. With its 8 roll-up windows allow for good ventilation. The single doorway rolls up to remain open, or zippers close it. The steel tube frame is coated with a High-grade silver powder. Includes guy ropes and stakes for added stability. Best Choice includes a 60-day warranty with all their products. Size is 15 x 7 x 7 feet. There are 8 windows, with 4 at each side, each with roll-up shutters. One single doorway at one end. The materials include steel tube frames, PE plastic clear green cover with net windows, guy ropes and ground stakes. Assembly is required for this product, with many customers are reporting that this model is easy to put up in a few hours, but remember to face the bolts inwards so as not to tear the cover. Tunnel shape with a curved roof. Comes with a clear green. Customers indicate that they have used heaters with success, in this version of a grow house. With the use of eight netted windows to open or close, it should allow ample aeration in the warmer months, though it does only have a single doorway. The cover allows ample light in, and in summer it holds the temperature well at night time too. There have been reports of weak zippers breaking on the doorway. Customer Services for this company are helpful, provided that you are still within your warranty period of 60 days. The PE cover is reinforced with nylon, making it a heavy-duty quality. On the negative side, the straps for the pegs come a little short to provide solid support. As with most poly-tunnels, you might be better to add your own extra reinforcement to the cover. This way you make sure wind cannot get up the sides and blow it over. Though customers have said their version of this model has withstood the snow. If you are keeping a poly-tunnel up in winter, it is better to add an extra-large sized tarp over it. Check your package when it arrives, as there are reports of missing parts and damage. Again though, if you are still within your warranty period, replacements should soon be on their way. Instructions are not very clear. Some have reported that the cover fits quite tightly to the frame, but by placing the bolts on the inside then it should fit snugly. The problem with a snug fit is the reports of leakage at the seams. 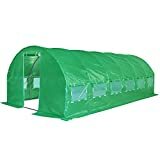 The BestChoiceProducts Polytunnel Greenhouse is not a bad choice, but the price and specs don’t bring it to the top of our list. We like the warranty, and the size is reasonable, but there’s not a whole lot that makes it stand out among the other choices on our list. If this polytunnel is on a significant sale, it may be a good choice, but otherwise, there are likely better options for your plants. Manufactured for Quictent, also known as Peaktop as a subsidiary. Eco-friendly, heavy duty, UV protected green cover. Two single zippered doorways, allowing wind to pass through. Twelve exhaust vents with Velcro covers, and white mesh netting for cross circulation. Galvanized 25mm steel tube frame, rust treated. Quictent offer a 12-month warranty on their products, but that could be dependent on where you buy it from. Extra Large 19.7 L x W9.8 W x H6.6 H feet. Eight windows, with 4 at either side, each with roll-up shutters. Size: H21 x W29 inches. Two doorways at either end, each at a size of W43.4inches. The materials include: steel tube frames, clear green reinforced PE cover with roll-up windows. guy ropes and ground stakes. Quictent has a nice greenhouse in their two-door portable polytunnel greenhouse. It hits all the major factors that go into a good polytunnel, except for one: the price! This polytunnel is significantly more expensive than the other ones on our list, which must be taken into account when considering the value provided. With the high cost in mind, customers who have braved the high price point have found that it is a solid greenhouse system. The reinforced cover seems to live up to heavy rain. It is well waterproofed and does a good job of keeping plants protected. Some even suggest it’s a good protector against frost, but of course, if your area gets particularly snowy, it’s best to take it down in winter. There is some discrepancy between the listing and specific size measurements, which may cause some confusion. The biggest impact is in the height, as the specs list a 7′ height, while the actual height seems to max out at 6′ 6″. Regardless, it’s tall enough for most people to stand up in, but buyers should be aware of the rounding Quictent has done in their listing. Quictent suggests using their plastic grow houses with caution if you experience high winds. The cover does come with extra material at the sides for additional anchoring, which they do suggest making use of for better stability. Most buyers have found this polytunnel greenhouse pretty easy to assemble. Quictent makes pop-up gazebos, and specialize in easy-to-assemble portable enclosures. The Quictent polytunnel greenhouse is a nice choice if it is on sale, but if it is not, some of the other options presented here today will likely suit you better, and allow you to stretch your dollar. It has all the features we look for in a quality greenhouse, it’s just that the price is on the high side. The final point in favor of this model is the good customer service that comes with it. All adding well-earned points to the possible purchase of this poly-tunnel. If you have decided that the poly-tunnel is the right type of indoor grow-house for you, then consider one with doors at either end for that all important air flow. Many customers have indicated that this is a particular problem with plastic greenhouses, the heat and humidity can be too intense in the warmer months. Our winning model, The OGrow Polytunnel, boasts plenty of doorways and window vents. The runner-up we chose, The Strong Camel version, does only have a single doorway but makes up for the many vented windows in such a small model. This smaller version appears not only popular with customers but is also quite robust. For the price, they are an economical option, as with extra care they can last up to 5yrs lifespan, and more. The extra care should include excellent pinning down of the cover, as this will help extend the life. Additionally, placing it in the shade if possible will help extend the lifespan of the UV treatment. If you have the combination of enjoying growing your own crops, space in your backyard, and not wanting to invest too much money into a greenhouse, then the poly-tunnel is the right option. Any of the items on our list are a decent choice, though we would start with the top picks, and work from there.